The HealthCraft SuperPole System is exactly what you need to stabilize yourself as you get in and out of bed, or mobilize around your bedroom, bathroom or kitchen. Award winning Health Craft SuperPoles are easily mounted at the bedside, in the kitchen or anywhere an extra bit of support for balance is needed. The HealthCraft SuperPole System stabilizes Atlanta residents with disabilities. 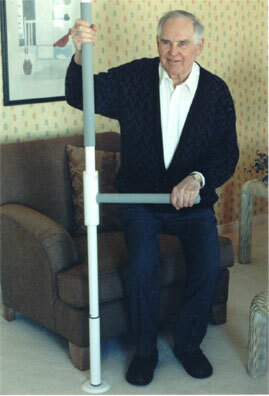 The SuperPole System is used to assist with standing, transferring, or moving in bed. It is an award winning modular support system designed for those requiring assistance to get in and out of bed due to a disability, progressive illness, or an accident. It is made up of a stylish floor-to-ceiling grab bar, which can be installed in minutes between a floor and ceiling. It is very easy to install or relocate from room to room as needed. Comfortable and attractive, the foam hand grip establishes a safe gripping surface, especially useful for people with limited hand strength. The clean and stylish design will fit in well in any home. The top end mechanism can be custom designed, and angled or sloping ceiling adaptors are available. The SuperPole also serves as a mounting support for a complete range of optional pieces that can be supplemented to accommodate changing needs, including The SuperBar, SuperTrapeze, SuperTray and Safety Island. Contact Atlanta Home Modifications, LLC for assistance in identifying and solve accessibility problems in your home. We help by providing ADA remodeling plans, wheelchair ramps for homes, handicap access showers, poles, and grab bars for showers. Our goal is to provide our clients with affordable and effective products and services. The HealthCraft SuperPole System is available to stabilize Atlanta residents with disabilities as they cope with the effects of disability, progressive illness, or an accident.